Three of the best high speed hand dryers are the eXtremeAir EXT & GXT by AmeriCan Dryer, the Speedflow By Saniflow Corporation, and the SMARTdri by World Dryer Corporation. All of the high speed hand dryers boast a dry time of under 12 seconds. The eXtremeAir EXT & GXT manufactured by American Dryer will dryer your hands in under 12 second, but the eXtremeAir EXT uses only 540 watts. The SMARTdri manufactured by World Dryer Corp. consumes only 400 watts with the fan speed set to low and the heater set to off. The surface mounted SpeedFlow manufactured by Saniflow Corp. offers a variable speed motor and is ADA compliant without having to use a recess kit like the other two models. 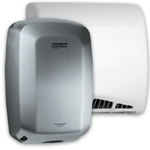 No other manufacturer can offer these features including the XLERATOR® Hand Dryers manufactured by Excel Dryer, Inc. These new generation of high speed hand dryers are efficient and hygienic. In addition, they incorporate the most cost-efficient and environmentally sound drying techniques. 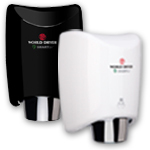 Whether high speed hand dryers are installed in schools, restaurants, shopping centers, hospitals, service stations, stadiums, movie theaters, correctional facilities, factories, hotels, health clubs, etc., each individual who uses these products are guaranteed safety and satisfaction.